Just because Halloween 2017 is over, it doesn’t mean we’ve stopped giving out cool prizes! 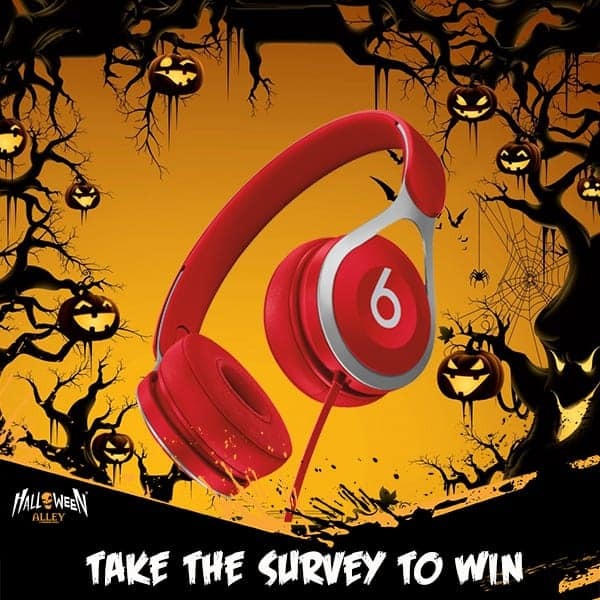 We’re offering you the chance to win a pair of Beats by Dre headphones. All you need to do to win, is tell us how we did this Halloween season. Did you love that we opened up Halloween stores in Australia? Were you impressed with our plus-size Halloween costumes? Maybe you hoped to find more Halloween costumes for your pet snake. Or do you dare us to offer up an even spookier range of Halloween decorations next year? Whatever your thoughts are, we want to know! After you’ve finished the post-Halloween clean-up, and you find yourself with a spare 5 minutes, in just a few taps on a keyboard you could complete our customer survey and be one step closer to getting your hands on this amazing prize. With a pair of premium headphones, you’d be able to listen to your favourite Halloween tunes to make you feel like you’re re-living your Halloween party all over again. OR, you could re-gift them as a Christmas present? Actually. Maybe not. They’re too good to give away, keep them for yourself!